Hi everyone! I am so excited to be here to share my first official challenge as a White with 1 Design Team Member. 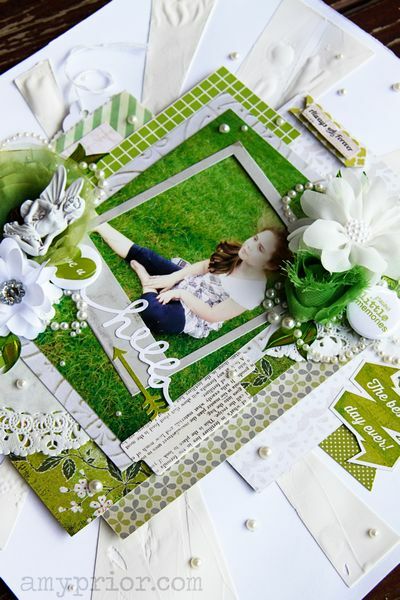 White with 1 is a super fun and popular scrapbooking challenge blog where the aim of the challenge is to include only white and 1 colour in your entire layout. A tiny bit of black is allowd for journalling distressing etc but that is it! The challenge colour for October is Watermelon. You can check out the White with 1 blog here or the Facebook page here. Here is my take on the challenge. The sponsor for this month’s challenge is 2Crafty chipboard so the Design Team all got lots of little chipboard bits to play with. I have had these photos of my eldest daughter Mia with her bestest buddy Tayla for a while and really thought they were perfect to use with this colour palette. The background paper is Heidi Swapp Color Magic and has been sprayed with a mixture of Heidi Swapp Sweet Cherry & Primrose Color Shine Sprays randomly. I have then added a drippy crackle paint circle over and over again around the entire background which added lots of fun white texture. The patterned papers vary as I raided my entire stash to get this watermelon variety but some brands include Fancy Pants Designs, My Minds Eye, BoBunny, Websters Pages, Kaisercraft and many more. 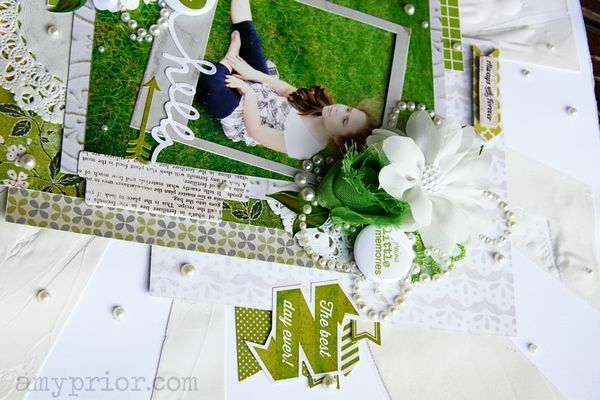 Lots of other gorgeous elements were included in this layout including the super pretty Jasmine Puffy Flourish in white from Flourish with a Bling. Various Patterned Papers including brands like My Minds Eye, Fancy Pants Designs, Kaisercraft, BoBunny,Websters Pages and many more. Thanks so much for stopping by and be sure to leave a comment with a link to your blog so I can come and visit you too. Until next time, happy scrapping! Hi everyone! 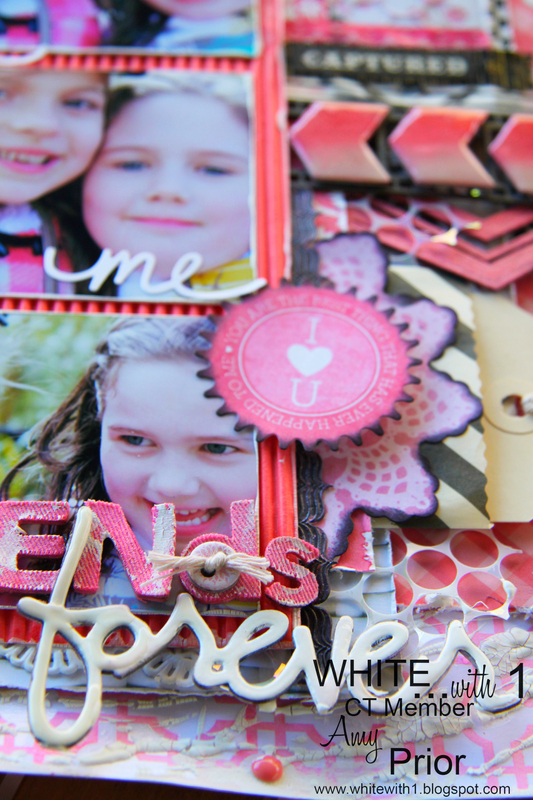 I am so excited to be sharing this layout today along with some very exciting news. I am on the fabulous new White with 1 Design Team starting in October. I did get the chance to play along this month’s challenge also and man it is awesome! Not only have they gone back to being simply white with 1 challenges but also this month EVERY single person who enters the challenge gets a free set of flair from A Lil Somethin no joke! I couldn’t believe it and all us DT gals got some to play with too. Click here to visit the White with 1 Blog and enter today. I just adore this photo of my eldest Mia. Both my girls had just finished rolling down a huge hill local to us called the skillion. It was their first time rolling down a hill and they thought I was so silly for suggesting it until they got to the bottom. They were so full of energy getting back up and running back up the hill to come roll back down it was such a fabulous day. Our whole church had just finished walking up the skillion with a cross for Good Friday and it truly was a magnificent day. 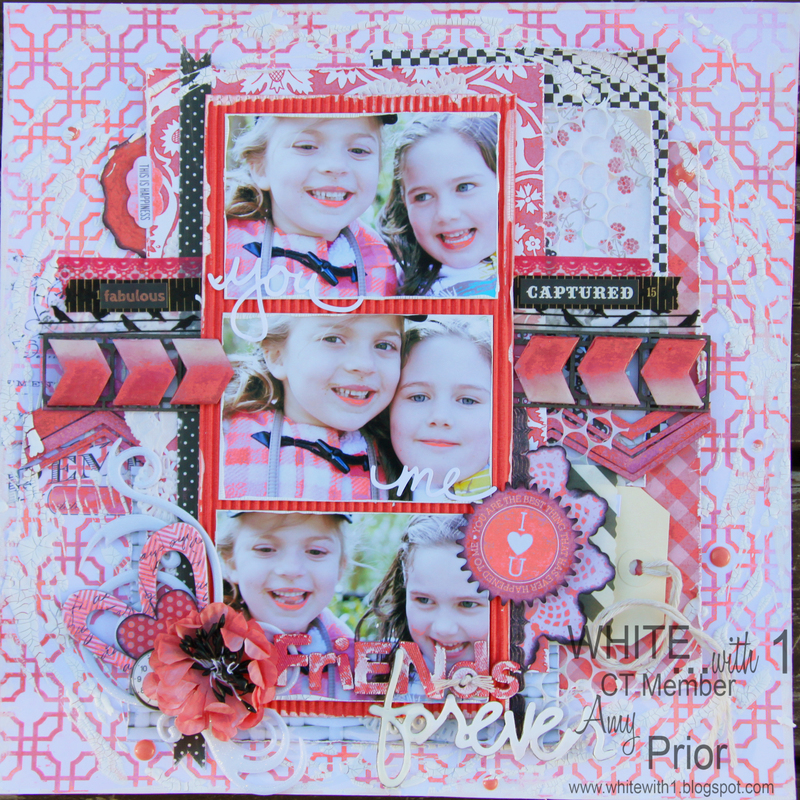 The background was created using Modelling Paste and a Heidi Swapp stencil over some White Cardstock. I have heat dried the modelling paste using my heat gun which created lots of bubbles and interesting texture. I then went to my stash and found whatever papers that I could find with either white neutral patterns or pistachio coloured. Man it was hard cause I found about 50 odd pieces of paper and then I had to sort out which ones to use LOL. 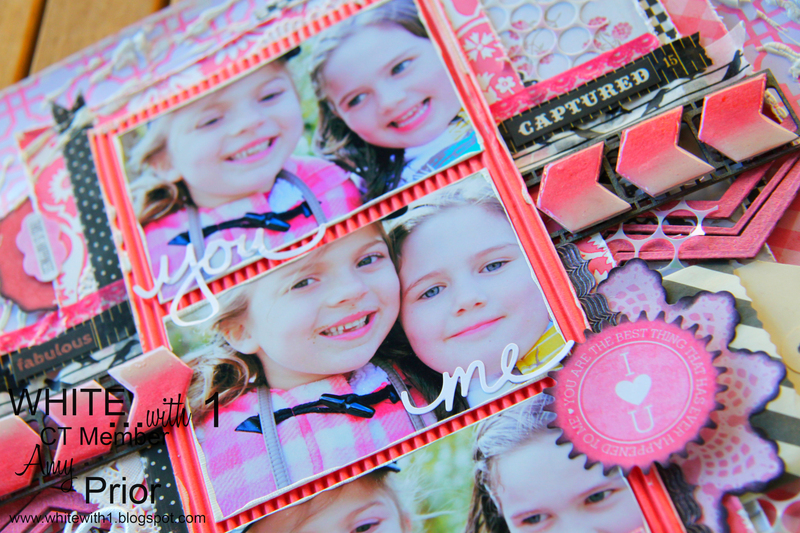 The papers are from various brands including My Minds Eye, Basic Grey, Websters Pages, Echo Park Paper Co, Stampin Up, Authentique and the polaroid frame on my photo is from Heidi Swapp. I had some patterned glassine bags from Fancy Pants that I thought was close enough for me to use to hide my journalling tag in so I have layered that underneath and my tag pulls out to reveal the description of the day pretty much just as I outlined in my above comments. I have added lots of yummy goodies to the layout including Flourish with a Bling flowers, Prima Marketing Flowers, Flourish with a Bling Individual pearls, flourishes and vines, Ingvild Bolme Shabby Resin and some stickers from various companies including Jillibean Soup, My Minds Eye & Echo Park Paper Co. The finishing touch was my a Lil Somethin Flair badges and some extra pearls here and there then I was done. 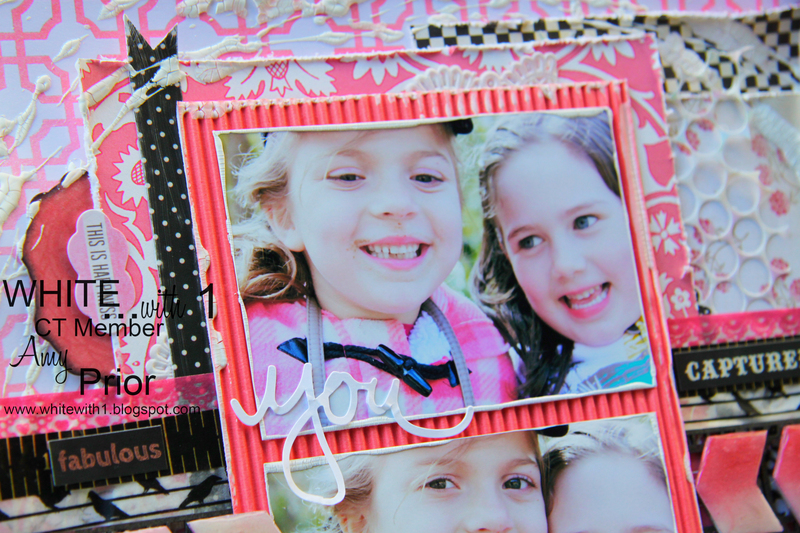 I was so happy with how this layout turned out I really love creating white with 1 you should definately all try it. Well that is it from me today and don’t forget to go on over and enter the white with 1 challenge here so you too can you get your pack of free flair badges!